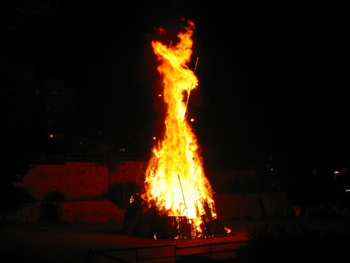 In Israel, on Lag B’Omer in most of Jerusalem and in many other towns and cities, including Meron, large bonfires are lit to commemorate the day on which the famed author of the Zohar and Talmudic teacher, Rabbi Shimon bar Yochi passed from this world into the next. According to the tradition, Rabbi Shimon did not want people to be unhappy on the day of his death, but rather he asked that people be happy, very happy. Around this large bonfire, men and boys dance as they sing songs praising Rabbi Shimon and it has become a “semi-festival” with a large pilgrimage of hundreds of thousands of people who go to the grave in Meron. Interestingly enough, not just religious and ultra-orthodox participate, but also the average secular Jew seems to gravitate to Rabbi Shimon’s grave in Meron to join in the festivities and to beseech the Almighty for help in what ever particular problem that he may be having. Who builds these gigantic bonfires? Generally it is the boys. For weeks before Lag B’omer, the boys scavenge the barren country side looking for poles, wooden beams and discarded tires. They slowly bring them together and build a tall tower with these items and other flammable materials that have been discarded from building sites and near garbage containers. The gathering is done with great joy and excitement. Contrast the above with what happened just several weeks earlier when a smaller fire was made. This one was on the day before Passover. Into this small fire we cast the remnants of our Chametz , the leavened bread that is forbidden on Passover. We burn these crumbs, not in a bonfire but in a small simple fire that is not more than several smoldering embers. It is just large enough and hot enough to destroy the crumbs. The fire was made by the father with his sons. Just a few pieces of cardboard and some small sticks together with a few pieces of paper to produce a small fire, certainly nothing to compare with a humungous two story Lag B’omer bonfire. There is quite a difference between the two fires in the mood of those who participate in these events. The destroying of the Chametz is a solemn affair; few are joyous, most exhibit concern and nervousness that the fire should burn the left over bread crumbs, for if some remain, perhaps the owner will have Chametz in his possession during the Passover holiday. 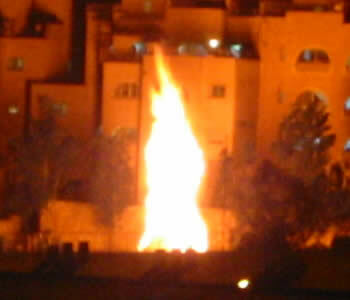 But since the fire is always small, it hardly enough to even burn the Chametz, much less totally destroy it. Compare this with the bonfire that in many cases can be two stories high, is ringed with singing boys and men, with many others standing in the background starring in amazement at the enormity and simple power of the fire. If we were to use a giant fire like this to burn our Chametz , it would be consumed in a moment, with out any thought of it remaining. Chametz symbolizes the evil arrogance of man; man is sloth in removing the last vestiges of his ego from his character therefore he lights a small fire, and therefore it is not accompanied with joy. Rabbi Shimon on the other hand did not require us to fast or to repent, but just to be happy, because he was not just a great teacher who revealed more of the hidden aspects of the Torah than had been revealed before, but was a totally righteous man. He requested that we be happy on the anniversary of his departure from this world; know that it is not a sad day – it is a day of joy in heaven above therefore we should also be in simcha. When we are in the presence of a truly righteous man, it is easy to be happy. Rabbi Shimon lit the way with a great light that shines through the generations, illuminating the path for all that choose to serve G-d with sincerity and simplicity. On the other hand when we try to our own path through life, with out a guide, the light in hardly sufficient to be certain that we have chose the correct path. We are like those who try to burn their Chametz in a small fire that is hardly adequate for the job. When we, alone, try to serve G-d with out a guide we find that it is very difficult not to make mistakes. That is why there is little joy, but rather the doubt if we are on the correct path eliminates the happiness that should come from serving G-d. So let the bonfire of Lag B’Omer be our guide. When we are to choose a path in serving G-d, let us utilize those great sages who have lived before us who were righteous and wise and gave us a direction in the proper path of coming to G-d. Let us follow that path of the sages of the Talmud among whom number Rabbi Shimon bar Yochai.